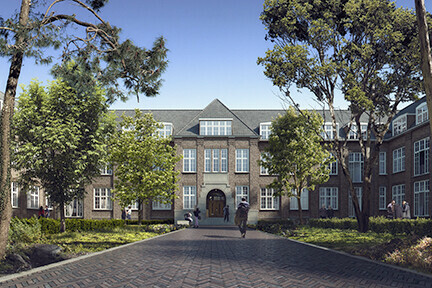 A former technical school gets new residents and continues as ‘De Meester’ of Haarlem. The former Middelbare Technische- en Ambachtsschool (Secondary Technical and Craft School) on the Verspronckweg in Haarlem looks noble yet dilapidated. The last official users left the building in 2009. Inbo architects Rik Bakker and Niek Schouten designed a full transformation of the robust building that forms an anchor in the neighbourhood. Earlier this month, the design was submitted for developmental approval. Five monumental spaces, among which we find the board room with its hearths and typical Arts and Crafts panels, are being fully restored to their former glory and lovingly converted into living spaces. Inbo collaborated closely with the Municipality of Haarlem and the Monumenten Advies Bureau (Advising Agency for Monuments) to retrace the building’s history. The nearly untouched and recognisable hallway structure will be retained; it was called a corridor design and was new at the time. A total of 176 rental apartments will be created, many of which will be in the former four-and-a-half-meters-high classrooms. This height is maintained on the façade, and entresols will be placed against the inner hallway. Part of the window frames will be lowered to create an access to the balconies and gardens. On the Verspronckweg side, the court will regain its formal appearance. The outbuildings that were later added at the back of the school will be demolished and replaced by new homes with a contemporary look, including about 25 starter homes. These new buildings will be placed around a more informal court and on top of the underground parking garage. De Meester is expected to be finished by the end of 2021.